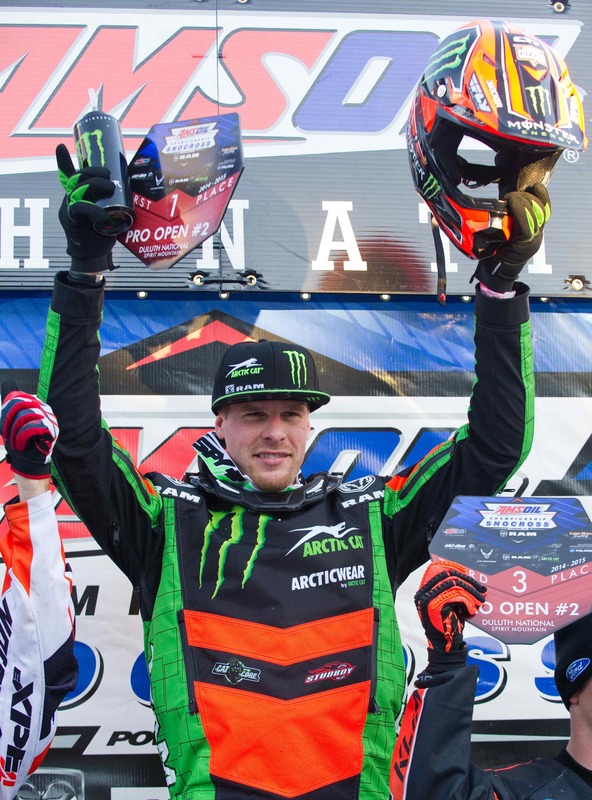 Monster Energy / Arctic Cat / Ram Truck’s Tucker Hibbert returned to his winning ways at the first event of the 2014-2015 ISOC National Snocross tour in Duluth, Minn. Hibbert’s raw speed and skillful ability to navigate a snocross course were on full display at the 23rd annual Duluth National as he won all his qualifying rounds and both final events. In Saturday night’s Pro Open final, Hibbert put on an action-packed show for the record crowd gathered on Spirit Mountain. With a sixth place start, he had his work cut out for him on the tight, big-air track. Known for his expertise to seek out lines, he moved around the track, picking off riders, one-by-one, while gaining time on the leader. He took over the lead on lap 13 of the 20-lap, 15-rider race, and pushed on to win the first Pro Open final of the season. Sunday morning’s temperature drop and wind sucked the moisture out of the snow, making the top layer of the track light and powdery. Knowing snow dust would be a major battle, Hibbert focused on winning his qualifying rounds to secure a good start line pick for the final event. His strategy paid off. He was second off the line and quickly took the lead. By riding smart, he moved through the snow dust and lapped traffic without an issue to capture his 97th Pro National victory. The Duluth National will be highlighted during the ISOC Snocross special on CBS Sunday, December 7 after the NFL game. The full races will be broadcast on CBS Sports Network December 14 and 21. Next up for Hibbert is his “home” race in Glyndon, Minn. December 12-13. Visit tucker-hibbert.com to view his complete race schedule.